For a free, no-obligation basement waterproofing quote, call or e-mail us today! We proudly serve Clarksville, Nashville, Jackson, the surrounding areas of Owensboro, Murfreesboro, Bowling Green, Philpot, Utica, Fayetteville, Marion, Franklin, Leitchfield, Paducah, Mcminnville, Hartford, Antioch, Shelbyville, and many nearby areas. Here's where we come in! If your home is located in the Middle Tennessee, Southwestern Kentucky, Greater Nashville area, we'll be standing by to help you. When it comes to wet basement repair, we at Frontier Basement Systems have it down to a science. We'd like to meet with you and show you firsthand why we're the best in the business! For a free, no-obligation basement waterproofing quote, contact us by phone or e-mail today! 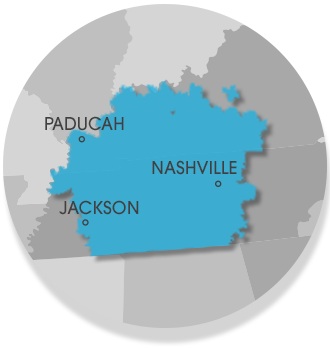 We proudly serve the Tennessee and Kentucky area, including Nashville, Clarksville, Jackson and nearby.